London police and a reconstruction team are still on sight on Wonderland RD as they try to piece together an accident that happened at 2:45 this morning. Preliminary investigation reveals that the driver of a single motor vehicle lost control of the vehicle at the intersection of Wonderland Road and Fanshawe Park Road. The accident that happened at Wellington Road at Montgomery Gate sent both drivers to hospital with minor injuries. London Police remain at the scene of a deadly crash in the city’s north end. Officers say it was around 2:30 a.m. when a collision occurred at the intersection of Wonderland Road and Fanshawe Park Road. Police now report that the driver of a single vehicle lost control of the vehicle at the intersection. Arson is suspected as the cause of an early morning fire in central London. Just before 3 a.m. on Sunday morning (Sept. 9), London firefighters responded to a call at the corner of Colborne and Piccadilly streets. A garbage fire outside a variety store is being described as a “deliberate arson”. At around three o’clock Sunday morning, fire crews were called to the area of Colborne Street at Piccadilly Street. In order to preserve the history of the London Fire Fighters, researchers and volunteers are needed to record and catalog historical artifacts and equipment as well as newspaper articles and various other publications. London Fire Fighters had to break up a scuffle while putting out an fire on St Patrick Street. An overnight fire has caused an estimated $50,000 in damages to a London home. At around midnight, fire crews were called to a house on Cherry Street, just north of Labatt Park. Upon arrival, crews found flames coming from a detached garage and reaching to the second story and roof. When disaster strikes and firefighters have to perform a rescue at a blazing homestead, what’s done for the four-legged family members whose snouts don’t fit into an oxygen mask made for a human? A kitchen fire in London’s southeast end has caused some major damage. 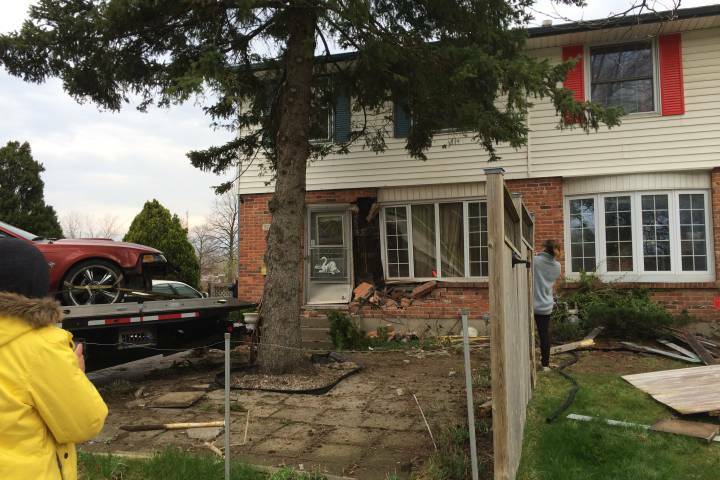 London Fire Crews say they were called to a home on Ashbury Avenue around 7:30 p.m on Friday. Officials say when they arrived on scene the family was standing in front of the home and smoke was seen coming inside.